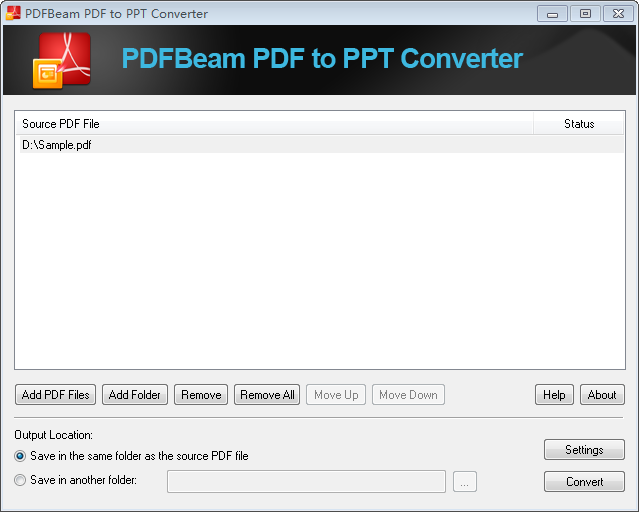 PDFBeam PDF to PPT Converter 10.0 Free Download - convert pdf to powerpoint (pdf to ppt) with excellent quality. pdfbeam pdf to ppt converter helps you convert pdf to powerpoint (pdf to ppt) in seconds, while the original layout of text, columns, tables, graphics and even hyperlinks are accurately preserved. with this software, batch convert unlimited pdf files at one time. besides, it supports converting encrypted pdf files in 12 languages.
? batch convert unlimited pdf files at one time.
? exactly retain all the original text, images, tables, graphics, hyperlinks, layout and formatting.
? select and convert any pages from the pdf file.
? the whole process of conversion can be finished just in a few clicks.
? produce editable and dynamic presentations in seconds.
? batch pdf to ppt conversion at high speed.
? support drag and drop operation.
? don't need any additional software, such as adobe reader or acrobat.
? support pdf files in 12 languages: english, turkish, thai, latin, korean, greek, cyrillic, japanese, chinese, german, french, and italian.
? support importing adobe pdf 1.0 - 1.7 formats (.pdf).
? support exporting microsoft office powerpoint 2003/2007/2010.
? it's extremely easy to use with the user-friendly interface. convert pdf to doc (pdf to word) with high quality..
an easy-to-use pdf to xls converter that helps you convert pdf to excel..
convert pdf to powerpoint (pdf to ppt) with excellent quality..